Dirt Under My Nails – Hi I'm Carolyn Marshall! 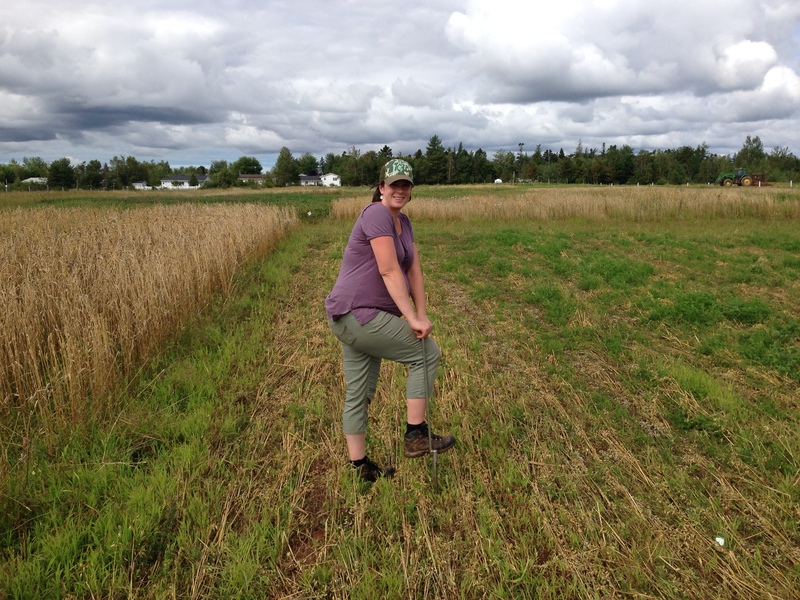 A soil scientist working toward a PhD studying the effect of green manure management on soil health in organic farming. I blog about issues in soil science, agriculture, academia, and policy. I've been known to paint my nails to cover up the dirt that I cannot get out from under them. Find my tweets @mcarolyn. Hi I'm Carolyn Marshall! 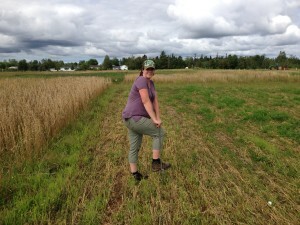 A soil scientist working toward a PhD studying the effect of green manure management on soil health in organic farming. 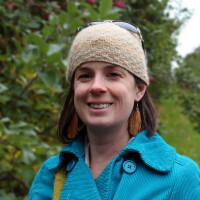 I blog about issues in soil science, agriculture, academia, and policy. I've been known to paint my nails to cover up the dirt that I cannot get out from under them. Find my tweets @mcarolyn. This might be a phrase you are familiar with. I have heard it most commonly used to refer to career women. Article titles like “How to have it all” or “No, you can’t have it all” or “Why Women Still Can’t Have It All“. And don’t stand it the way of my having it all either because you* better believe I’m going to have it all. Out of my way, haters! I have two adorable boys, 1 and 3 yrs old. Adorable when they’re sleeping in their beds with angelic looks on their faces. Less adorable when I have to reschedule a meeting 3 times because their gd daycare germs are picking off family members one by one. Kids don’t give two hoots that my supervisor needs a draft of that paper by Friday or that super important networking event is happening when my husband it out of town and I can’t find a babysitter. I can still have it all. As a grad student in science I am faced with a lot of traditional expectations. Working by the light of the bunsen burner into the wee hours of the night, reading through stacks of papers during the evenings and weekends, quietly crying over the 15th version of a manuscript. But I’m not going to conform to those out of date expectations. I’m good at what I do and I’m going to do it from 9-5, Monday to Friday (minus a few extra sick days, see above re: the cesspool of daycare germs). I’m going to produce results and if the way I got them doesn’t conform to your expectations you better get some new expectations. I have read many an article about problems in academia. Women leaving discouraged before they reach the higher ranks, disconnect from the general public, falling enrollments. I think it has a lot to do with the atmosphere around theses parts. Time to open the windows of the ivory tower and air out these stuffy halls and adapt to a lifestyle that lets everyone (men and women) have it all. We need to change the lifestyle associated with academia. Stop expecting people to be in the lab at midnight. Don’t look down on them because they have to leave early to take their kids to the dentist. Be inspired by their ability to be dedicated to their family while being no less dedicated to their work. *gasp* Academics enjoying a work/life balance? What a great marketing tool to grow academia with the best and brightest minds. Think of what a university full of less stressed, inspired, and happy faculty could accomplish. 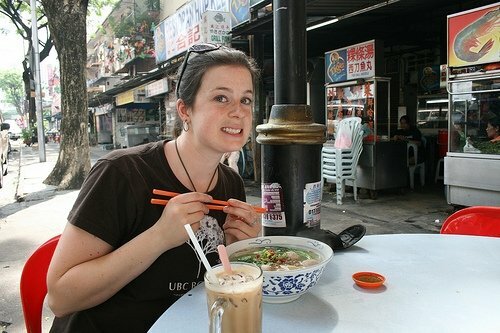 I’m feeling inspired to write a series of post about my journey to ‘having it all’. How will I possibly ever do it? Probably with awesomeness and class. Let’s find out. *The ‘you’ I keep yelling at is probably not actually you (but maybe). It’s the the general patriarchy of academia. Is that you? Booooooo. **Not an actual survey, but it’s probably true. 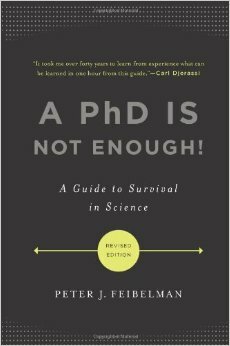 I recently started reading A PhD is Not Enough by Peter J. Feidelman. The first chapter of this book is a cautionary tale that gives six stories of academics whose careers took a wrong turn over mistakes that could have been avoided. The first five use the pronoun “he” (names are just initials to protect identities). By the fourth story I was already rolling my eyes and waiting for a ‘she’. Huzzah! There she is, in the sixth and final story. Whew. All five male stories focused on the career consequences of poor choices. Getting pushed out of basic research or not getting hired into a permanent position. The female story actually resulted in tenue but is considered a failure because her marriage failed, she didn’t have time to have children or “[relax] with a good novel”. The suggestion that could have saved her career: pick a path with less demanding hours. The sexism here is so obvious. There’s been a lot of hub bub lately about sexism in STEM because of the Tim Hunt episode. Some say it’s been taken out of context and blown out of proportion. Like this fantastic article states about his comments, “they were the drop that finally caused the bucket to flow over“. A bucket full of sexist B.S. Then I read this book and am slapped in a face again with what is a very real opinion of women in STEM fields – we aren’t as committed because of our family obligations and are more delicate than our male counterparts and need to be treated accordingly. We’re going to need a bigger bucket because the B.S. is still coming. When sexism is so ingrained and is very clearly preventing women from reaching the top ranks of academia books like this are just confirming everyone’s bias (conscious or not) that women can’t cut it, that we’re not as serious, that all we really want are kids and time to read a good novel. The same goes for Tim Hunt’s “joke”. When women face colleagues and supervisors who actually hold these beliefs, it’s not ok to joke about them. I know when I apply for a job after my PhD I will face this bias. For example: “Childless, unmarried women earn 96 cents for every dollar a man earns, while married mothers earn 76 cents” (NY Times). Ouch. It’s not a joke to me, it’s reality. I couldn’t resist sharing this beautiful, and still relevant, verse from 3500 years ago. Don’t talk about religion or politics. That is usually sound advice to avoid confrontations at the family dinner table over holidays or what to discuss with your hairdresser. But food? Oh yes. I have come to realize that food is an extremely emotionally charged subject. What food you put in your body is a very personal choice influenced by culture, religion, upbring. Parents are under intense pressure to feed their kids food that is going to make them healthy and give them the best shot at success in life, and possibly face public shaming if they make the (perceived) wrong choice. There is a reason people roll their eyes at the vegan at the dinner party explaining why they can’t eat what you’ve cooked for them. It’s akin to the Jehovah’s Witnesses showing up at your door. They want to convert you, you don’t want to be converted. Lately I have seen a flood of misinformation about food and agriculture being pushed with a message of fear. This is toxic, that will give you a tumour, if you eat that you’re responsible for everything in the ocean dying. Eep. Talk about pressure. So, as a scientist I want to counter-attack these falsehoods with facts. But that doesn’t work. You can’t fight an emotional fight with facts. So how do I fight back? I don’t really know yet. I’m learning. We recently had Dr. Kevin Folta talk on our campus about communicating science. One point he made was that one of the most credible voices in science with the general public is the ‘mom scientist’. Sweet, that’s me. I’m a mom scientist! So here goes. I feed my kids GMOs. Gasp! I know…blasphemy from an organic agricultural scientist. But let’s be realistic. Who hasn’t bribed their child with a few goldfish crackers made with GM canola oil to get them into the car in a timely fashion? Is this food in Kuala Lumpur GMO free? How do you say GMO in Malay? Who cares, it’s delicious! We buy organic milk and yogurt, but not because regular milk is full of toxins, because I like the regulations around animal welfare enforced on organic dairy farms. I buy organic produce when I can, because I like the farming system better as a whole, not because glyphosate is going to give them cancer. But the organic produce selection is pretty small in Truro, NS this time of year so that conventionally grown broccoli is going to do just fine. Also, if all the world’s agriculture was suddenly made organic we would have a serious supply issue. The global agricultural systems is just not set up for that. People would starve. We need conventional agriculture too. So as a mom scientist, I encourage you all to question your food; what’s in it and how it’s made. But make sure your find a good source of information. I know that’s a big ask. I’m not even really sure where to send you for a good, one-stop food resource. Maybe you have a mom scientist friend too. Or an any scientist friend. Or a dietitian friend. Or a farmer friend. 2015 is the UN’s International Year of Soils. Now, you might be feeling year/month/day celebration exhaustion. I know I am. According to the Wikipedia listing of commemorative months (yep, that’s a thing) there are 8 different themes to March, from colon cancer to frozen food (that one has to be a joke, right?). March also has Pi day, but two days later is also has artichoke hearts day, with oatmeal cookie day two days after that, and on and on it goes. It’s all a bit much and I tend to brush off most of them. The number that really sticks out to me is that 33% of soils worldwide are degraded. That’s a lot, especially when you consider the time it takes to make soil (up to 1000 years just to get 1cm deep soil). When almost all the food we eat depends on the soil, we could be in big trouble! The good news is that last number in the infographic – a 58% increase in crop yield with proper soil management. Obviously that is going to vary hugely depending on location, crop, and condition of the soil but the point is we can make more food by caring for our soils. So take a minute to read over the infographic and get acquainted with soils. The more people know about soils the more people will care about soils and the more care we collectively can take of our soils.